You are here: Home / Featured / Avengers & X-Men: Axis #1 Review! World War Hate Begins! The event that Rick Remender has been hinting at since the beginning of Marvel Now! The story that he has been setting up throughout both his Uncanny Avengers and Captain America runs is finally here! The event that will change…ah screw it that joke’s not funny anymore. So yes, Marvel’s latest event, Avengers & X-Men: Axis has begun, and boy has it been a while since Marvel’s last event (for the record, Original Sin ended a grand total of five weeks ago). Who wants to bet that Marvel is going to announce its next “Game-changing” event halfway through this one? I mean they announced Axis before Original Sin even began. Anyway, event-fatigue aside, I have been looking forward to this book since it was announced, and now that I finally got to read issue one, how does this book begin the next event? Before I get into the specifics of the story, one problem with this issue is that this isn’t actually the beginning of the story. This story actually began back in Uncanny Avengers #24, and Axis takes place directly after the final page of Uncanny Avengers #25. While the first few pages of this does an admirable job of catching the reader up on what they need to know for Axis, going all the way back to Avengers vs. X-Men, a lot of things happen very suddenly for new readers. 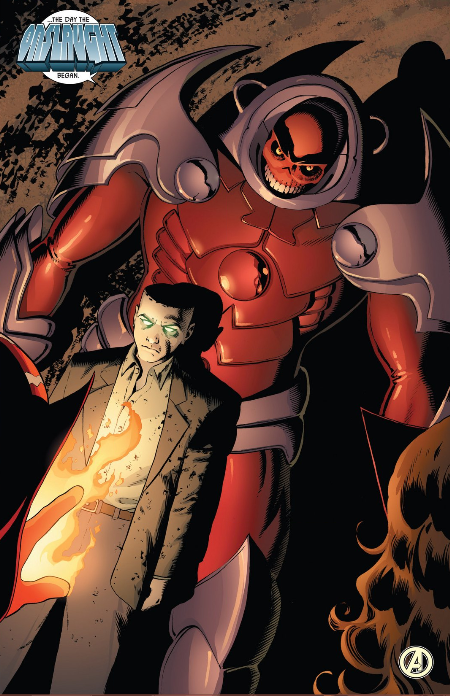 The most notably example of this is the fact that Red Skull is now Red Onslaught; makes sense if you been reading Uncanny Avengers, not so much if not. This doesn’t make the issue unreadable, just not the most new reader friendly. Rick Remender’s writing is good here, but can come across as rather unfocused. He’s balancing both a lot of characters and a lot of plot here, which can be rather over-welling for some unless you’ve been following these stories for a bit. Granted, a lot of these plot points are temporary, as Red Onslaught’s “hate waves” (or whatever they call it) are dragging up all the frustrations these characters have and bringing them to the forefront. Examples include Rouge’s problems with the Scarlet Witch, Havok’s anger towards his brother, and even bringing up Hulk’s problems with Iron Man that were revealed in Original Sin. Again, these don’t last too long and are meant to show how powerful the “hate waves” are, they just might catch new readers off guard. What is more problematic for new readers (even of just Uncanny Avengers) is that Remender relies pretty heavily on the problems Havok and Wasp are going through involving their marriage and child. Other than some issues with new reader friendliness, the stakes are shown to be high, there are great character moments, funny lines of dialogue, and the pace is surprisingly fast for a first issue (especially for a Marvel event recently). Andy Kubert’s artwork is solid overall. 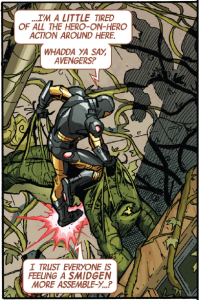 He does a good job presenting multiple kinds of battles, from super-teams fighting a giant demon monster, the Avengers against a plant monster, and even just plain simple one-on-one tussles. Kubert depiction of Red Onslaught is very cool (though different then how he first appeared), and the destruction his massive form causes is also very impressive. Some may have some problems with his more scratchy pencils, but that’s a matter of taste. The decision to bookend certain pages with long strings of AXIS being repeated over and over doesn’t really make a lot sense, and just makes the pages feel cramped. What is rather refreshing about this story is that it’s so far about a group of heroes going up against one clearly evil villain. Instead of past Marvel events where it’s Marvel heroes against heroes, an alien invasion that requires the union of all the alien races, or a killer robot that is so power he is basically invincible and exists in the future (don’t ask). I’m not saying these are bad stories, it’s just we’ve been getting this story over and over recently, and it’s just nice to have a big event comic be a steroided up black/white good vs. evil throw-down. We’ll see if the event remains that in the following issues. Avengers & X-Men: Axis #1 is a decent start to Marvel’s next event, and sets up some rather interesting possibilities for the rest of the series. The writing is enjoyable and art is cool, but unfortunately this issue suffers from not being a self-contained story, even though it’s a first issue. 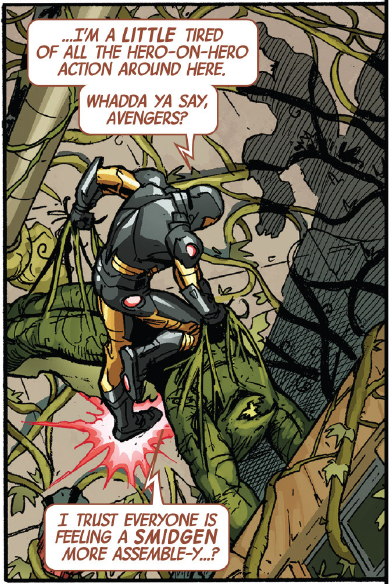 If you’ve been reading Uncanny Avengers (and Captain America doesn’t hurt), than you will have no issues here. If this is your first exposure to these titles, you won’t be so lost that everything they say is gibberish, it’s just that a fair amount of the plot relies on familiarity with what has happened in other titles. It’s all right, let’s just hope with event being nine issues long, Rick Remender doesn’t stretch things out to the breaking point to “justify” its length as previous Marvel events have (looking at you Age of Ultron).